Following the closure of CHP in a 1980 coup, former chairman Bülent Ecevit was banned from politics and wanted to create a new political party based on his political theories. 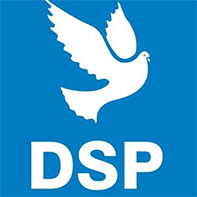 Democratic Left Party (DSP) was established by Ecevit's wife Rahşan on November 14, 1985. It became the largest party of the center left in the 1995 elections, and was the winner of the 1999 elections with 22 percent of the votes. DSP was the biggest loser of an uneasy three-party coalition and only received 1.22 percent of the votes in 2002, losing most of its voter base to CHP. It made an alliance with CHP in the 2007 elections and secured 13 seats in parliament, which was not renewed in 2011. It has remained a minor party ever since. Its emblem is a white dove on blue background.